TOP 10 Best Volleyball Shoes to Buy in 2019 : When it comes to the delivery of a full body workout, playing volleyball is the real deal. All the serving, jumping, blocking, and spiking engages your whole-body muscles for impeccable fitness level. Outwitting opponents also helps keep your mind sharp. The better the benefits, the higher the risk of injuries, more so if you don’t equip yourself with the best footwear for volleyball. Keep court mishaps minimal by selecting any of these best volleyball shoes as you up your game. #1 How to Choose the Best Volleyball Shoes? You can expect any sports shoes to take quite a beating during the period it is in use. Volleyball shoes are no exception to this exposure. All the hard landing, up, down, high pressure, and side-to-side movements cause an untimely disintegration of a poorly made pair of shoes. Trust me, from experience, nothing could be worse than your volleyball falling into pieces in the middle of that all-important game. In extreme cases, there could be a risk of injury. Thus, carefully consider the quality of materials used to make the shoes. In this way, it’s bound to last you for the whole season, and longer. The sole should also not warp as it affects the fit. While its common practice to wear volleyball shoes as casual wear, I suggest you invest in an extra pair and only use these on game day. The idea is to minimize wear as much as possible. Also, look for a combination of synthetic overlays and rubber outsoles for durability. The sole fitted on your volleyball shoes is the cornerstone of the performance characteristics of your shoes. It is the role of the outsole to generate the desired level of traction and grip on the floor. You will find two types of outsoles: natural rubber and synthetic. Synthetic outsoles are cheaper than rubber outsoles but generate less amounts of friction force. Therefore, rubber is the better option with its impressive traction ratings. Also, there should be open grooves on the outsoles. Don’t choose the ones with closed in grooves as these trap water, which then minimize frictional forces generated by the sole. Breathability is mandatory in all sports shoes. A closed in shoe is the perfect recipe for a bad shoe-day. The result is either smelly feet, blisters or both. These are distractions that lower your game morale. The right amount of airflow, without letting in moisture is critical. Also, remember to wear an appropriate pair of socks to further aid in breathability. Avoid leather materials at all costs. Instead, opt for synthetic meshes, or an appropriate breathable material. Nothing feels quite good like finding the perfect fitting pair of volleyball shoes. But it isn’t as straightforward as you might think, partly due to the numerous brands, models, and sizes available. If you are shopping online, extra care has to be taken to avoid buying the wrong shoe size. Consider several factors, such as going through the reviews about that shoe, then list the fitting score. Common scores include true fitting, running small, or running large. Also consider if you are to size half a size large or small, depending on the score rating you list it. In a volleyball team, the setters probably have the most critical role. At times, theirs is the most frustrating because of the responsibility. All-around ball control, astute communication skills, and teamwork are required of them. The ASICS Men’s Volley Elite is, therefore, a top-notch shoe option to make the responsibility a little easier. This shoe model does not only look great on you. It is designed to excel when under pressure. Part of the shoe design includes the inclusion of a FlyteFoam type of cushioning for shock absorption. Consequently, less stress if felt at your knee joint, especially when performing sets involving aggressive jumps. An outsole that’s specifically made for playing volleyball stabilizes you in the course of jumps, sets, and when performing tricky moves. Another great feature is the ankle support, thanks to the high tops. The gel support system not only works to ease the pain on your knees but also to lower the workload for rapid transition. Synthetic overlays compliment the winning shot that you are just about to set in motion. The rubber outsole guarantees that much-needed grip to bring you to a full halt in a moment’s notice. A trusstic system technology increases the structural rigidity of the shoes while minimizing its weight. Thus, you don’t have anything weighing you down. I have a feeling the cost could be cheaper than the one indicated. Also, the lack of lateral support works against the shoes. Its affinity to dust is another inconvenience wearers have to deal with. 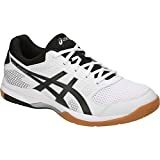 With adequate arch support to boot, the ASICS Men’s Gel-Netburner is among the best volleyball shoes currently available. It is stable, comfortable on the inside, and built to last for long as you go through your favorite sport. Since the high-top fit is eliminated in the design, your ankle gets adequate support while still being able to move about freely. As the name suggests, this shoe is packed with excellent gel cushioning in both the forefoot and the rear foot. This Gel Netburner Ballistic technology is a necessity for volleyball shoes as it absorbs the pressure off your heel with every twist, turn, and jump that you make. Excellent shock absorption properties give the feeling of a lofty walk, even when under pressure. During the construction of the shoe, particularly the outsole, preference is given to natural material, rather than synthetics. More specifically, rubber is the main component of the outsole, owing to its ability to generate traction. Consequently, those swift movements that you yearn for can be brought out in the court without the risk of slipping. These shoes provide the right balance between value for money and the cost. They are stylish, lightweight, fairly priced (in my unbiased opinion), and are of great quality. However, they have a tendency to run a little small. Keep this in mind as you select the right shoe size. In order to make the shoe as lightweight as possible while still retaining the much-needed rigidity, the Mizuno RX3 features a blend of synthetic and textile materials within its structure. The result is a durable shoe that weighs approximately 8.4 ounces, making it one of the lightest volleyball shoes currently available. Away from the weight, this pair of shoes is packed with comforting features, a great fit, supportive arch, and durability features. Another admirable feature is the way in which volleyballers quickly break into the shoes when bought new. It saves you from the occasional blues of compressing brand-new shoes in the midst of that all-important game. Measured from the arch, the shaft measures about 2.25 inches. That dimension should be great for your arches support. A seamless upper design cuts down on the weight, while evenly dispersing your weight throughout the shoe, for improved performances. A parallel Mizuno wave technology spreads shocks throughout the sole for stability in the court. A Dynamotion Fit system adjusts the foot placement to a natural position, thereby eliminating foot distortion. Ventilation pore within the midsole imparts breathability for comfort by minimizing humidity and heat levels in the shoes. When sizing these shoes, take care to size them up by half since they run small after a while. Volleyball is just as beneficial to kids as it is to us adults. Any sport helps kids to grow into responsible adults by staying active and making new friends every time. Without the right pair of shoes to protect them from injuries, pain, and discomfort, then the probability of them sticking to this sport reduces considerably. The ASICS Upcourt 3 GS is one such shoe that’s best for kids or youths who are developing a hobby for volleyball. As volleyball shoes intended for youths, the design takes into consideration a host of requirements, whether they are for a blocker, server or a hitter. Among the features, it is comfort that is prioritized, enabling kids to fully focus on improving their game. Part of what makes these shoes comfortable is the admirable breathability. This feature is great since it keeps out the build-up of moisture courtesy of sweaty feet from the intense game movements. Detailed aesthetics property makes kids to stand out among the team, once they step out into the game. That act alone acts as a good morale booster. A traditional lace-up closure generates a snug fit, suiting every kid’s shoe size and shape. At the toes, each shoe is rounded for sufficient toe space, then reinforced for durability. Rearfoot Gel cushioning enhances shock absorption/resistance. A gum rubber outsole extends throughout the length of the shoe. Having to buy a half size larger is an inconvenience you will have to deal with. The Mizuno Women’s Wave Supersonic is among the best volleyball shoes for women. As a new entrant into the Mizuno line of volleyball footwear, this shoe features updates not present in some of the earlier versions. In fact, its an updated version of a previously popular Mizuno Hurricane, even though it retains the original after-thoughts in its design. This new line features both lateral foot support and comforting features by incorporating a host of shock absorbers to cancel out shocks when landing. If you are one of those players who consider the shaft measurement of a shoe, then this one measures low-top from the arch support. The intention is to make the shoe as flexible as possible, minus the rolling inwards. Volleyball is an endurance sport, involving strenuous workouts. Hence, you are bound to get sweaty after a couple of minutes. As the sweat accumulates in enclosed shoes, discomfort kicks in. However, these shoes have a workaround by introducing an AIRmesh Upper that is porous to allow for the free flow of cool air into the shoes. In addition to breathability, good in-shoe feel, and comfort, other noticeable features include an advanced cushioning mechanism. Besides having a lofty feel for shock absorbency, the materials used are lightweight. Moreover, a smooth and fast foot movement is a critical part of your overall game performance. At 10 ounces, this pair is one of the lightest you can find. Thanks to an air mesh shoe upper, the Adidas Crazyflight X2 are breathable, a fundamental feature for jumping then hitting. Likewise, on the outside, the shoes are constructed with rubber addiwear, enabling jumpers to effortlessly glide through the courts albeit without the risk of slip-ups. These two features make the shoes comfortable and durable at the same time. Because of the wealth of responsibilities bestowed upon hitters such as playing in both rows, passing, and blocking hits, you need a shoe brand that’s also all-rounded like you. That is why the stability and durability of these shoes are ideal for a seamless volleyball experience. Apart from the traction generated by the outsole, it’s also non-marking to maintain a floor’s beauty. Once an athlete steps onto the court floor, this shoe brand protects its integrity by eliminating shoe marks. During jumps to make a hit or passing, the Boost Cushioning system comes into play. This technology lowers floor impacts while assisting in toe-offs. If you consider the load rate felt by your knee as you land from a high jump, then you’ll realize how important this feature is. 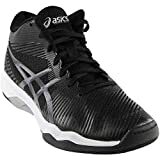 Since the occurrence of injuries is frequent in volleyball, these shoes are ideal choices if you are looking to alleviate any such occurrences. Other features include a SPRINTSKIN upper for efficient air-flow within the shoes, a PU sock-liner, and an aesthetically pleasing design. Perhaps one of the flaws in these shoes is their tendency to widen with time, loosening the fit. Built with player stability, arch support, and comfort in mind, this men’s version of the Netburner Ballistic is one of the best volleyball shoes money can buy you. With a good producer to boot, there is every reason you may want to invest in a pair of these Netburner Ballistic. Furthermore, as your team’s opposite, these shoes compliment you in a number of ways. Opposites are obligated to have a vast array of skills in order to excel in their unique roles. For one, you must be quick in making decisions, be versatile in hitting and be alert to make split-second plays. In this fast-paced role, key features to look for in a shoe brand are excellent cushioning as it involves a lot of jumping. For this, the extra padding on the Ballistic makes it ideal. Plenty of other shoe creations makes it a phenomenal volleyball shoe choice. Just like the women’s version, this model also has both forefoot and rearfoot gel cushioning. Moreover, the use of Natural rubber not only adds to the cushioning effect as you land but also gives a sure-grip on the floor, regardless of where you land after a successful block of the opponent’s play. A combination of synthetic materials and natural rubber are perfect for balancing between durability, comfort, and functionality. A lace-up closure system has the ASICS logo embroidered in the lush tongue to distinguish the fakes from the original shoes. All in all, the range of colors makes them ideal for the opposite sexes. The shrinking is also a nuisance to contend with. With great power come great responsibilities. Such is the scenario volleyball Liberos often find themselves in. Since you have to dig deep in order to pull out the defensive responsibilities you are charged with, stability and shock absorptions have to top your priorities. Fortunately, the Gel Rocket 8 is one of the shoes that meet these criteria that you may choose from. Actually, this shoe brand is among the best sellers on Amazon because of the impeccable stabilization characteristics a liberos needs in the back row. Due to the intense nature of their play, these shoes are fitted with a midsole that’s specifically molded for this type of applications. Resultantly, your rear and forefoot are adequately cushioned for soft takeoff and landing. Another great feature is the Trusstic System technology infused into the shoe’s DNA. This is a great feature because it stabilizes the shoes on the court floor. Together with the gripping efficiency of rubber, liberos have the ability to change directions as much as they would wish. Keeping your team in the game would be hinged on this feature. In addition, I find the size to fit true, just as indicated. Rarely would you have to size them up or down as you anticipate for future enlargement or shrinking. Liberos do not have to worry about the weight either since they are made to be as lightweight as possible. In as much as I really love these shoes, I feel the prices do not do them the justice they deserve. The Rocket 8 features more advanced features than its predecessor the rocket 7, the latter still packs some impressive features for you to excel in a court. To begin with, the forefoot is lined with a cushioning mechanism in order to reduce the impacts generated by landing. In essence, you won’t feel the accumulative pain as a result of endless jumps. Besides, a meshed shoe upper promotes the free flow of cool air within and without the shoe. This feature comes in handy in keeping your feet cool throughout the game. It does so regardless of the weather condition. Plus, this shoe performs quite well in terms of weight to strength when compared to a host of other products in the market. The low weight reduces foot fatigue, especially when a game drags on and on. Part of construction is a padded tongue. It combines with the plush heel collar to provide a comfy in-shoe feel. The secret to its lightness is down to the exclusive Trusstic system in the midsole. This feature is synonymous with all the ASICS volleyball shoes in this product review. The grip is great too due to the use of NC rubber in making the shoe outsole. If it’s of any importance to you, then it is worth noting that this shoe is actually the best seller in the men’s volleyball shoe category. Just as with some of the other shoes, you have to buy a size smaller. As a volleyball player, you demand the absolute best from any footwear that you buy. This is the first step in making the sport enjoyable. With the Mizuno Wave Lightning Z3, ladies have a shoe that’s padded all round, particularly along the tongue and collars. The ability of the upper to keep your feet cool is another admirable feature during the strenuous exercises. While preparing for a game, remember that the insole is removable, meaning you can pack an extra for continued comfort throughout. These insoles also act as supportive mediums for your arches. In return, your feet would not feel sour at the end of a game. Perhaps the reason why I like this model is because of its budget-friendliness. They do not cost you much, but still pack the features of a high-end pair of shoes. A parallel wave plate and a low-cut configuration add to the amount of traction generated. Subsequently, swift turns are possible. Better still; the shoes have plenty of room to accommodate an ankle brace. Even after suffering an injury, you can still have the best games in these shoes. Q: Why are some volleyball shoes costlier than others? A: The major reason for the disparity in pricing is the technology infused into the shoe and the production method used. Advanced technologies increase the prices, just as the poor quality of materials cut down on the production costs, thus reduced prices. Q: What’s the ideal shoe weight for a volleyball shoe? A: It is a general rule that ladies’ shoes be slightly lighter than those meant for men. Typically, if you are a lady, then look for shoes that weigh from 9 to 10 ounces. For men, anything between 11 and 15 ounces should be ideal. Q: Can I find volleyball shoes for kids or youths? A: Yes, there are, but not so many. As you will realize in this buying guide, you can definitely find a volleyball shoe for your young volleyball enthusiast. Q: I have wide feet. Is it possible to find matching volleyball shoes? A: Nowadays, manufacturers have realized the need to avail shoes for different foot types. That’s why you can find virtually any shoe type you want if you take your time to research. Q: What is the most important feature to consider when buying a volleyball shoe? A: For a volleyballer, the gum rubber sole is your most important court companion. This natural rubber sets these shoes apart from either running or cross-training shoes. Cushioning too is critical especially because of the side-to-side movements involved in volleyball playing. For you to realize your volleyball dreams, you have to be mentally focused on your training and game. Any other distractions such as pain, discomfort, slippery surface, and arching foot should be out of the equation. Ignore the widespread misconceptions that basketball shoes and volleyball shoes are interchangeable and buy the specific shoe for each sport. They require different attributes that may not be available in either option. It is the shoe brand that suits most of the rugged needs of a volleyball court, thus permitting you to focus on the task you have ahead, how you move, your ability to make split-second decisions, and making the winning goal/hit that wins your team a match. 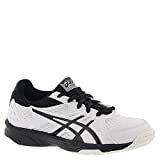 If you are looking for the best volleyball shoes, then you might opt for the ASICS Gel-Rocket 8 Volleyball Shoe. In my opinion, and many will agree with me, it offers better breathability, durability, and fit than most of the volleyball shoes around.